The hospitality industry is no longer asking whether digital signage is worth the investment. Today, the question has become: Just how much of the technology’s value is yet to be tapped? Up-to-date and readily accessible information is as important as any amenity that a hotel can offer. Today, flat screen displays have migrated beyond hotel and convention center meeting rooms to appear where guests gather, wait, and make decisions. More importantly, digital signage has both simplified and accelerated the ability of hotels and convention centers to customize and update information at will from a central location. Even when hotels belong to an international chain, their services, amenities, and events are often unique to their location — and may even change over the course of a day. The same applies to convention centers, which cater to a constantly shifting range of audiences and events. As digital signage evolves it will integrate even more compelling content elements, such as IP-streamed video. However, as it adds new and valuable features, it will also need to deliver its established benefits without compromise. It may be tempting to think integrating live and on-demand video into digital signage might significantly increase its cost and complexity and put more pressure on limited network bandwidth. Ironically, the hospitality industry voiced similar concerns about digital signage nearly a decade ago. Before debunking these myths, let’s first consider the potential value to hotels and convention centers. That value begins with video, which is even more effective than digital signage at attracting and holding attention. When integrated into digital signage, video not only draws attention to itself, it also attracts eyeballs to the accompanying graphic and text elements. The potential applications of videoenhanced digital signage for hospitality go beyond streaming video of news or weather channels. Imagine being able to display a guided video tour of a hotel’s higher-end offerings that encourages arriving guests to explore new amenities or upgrade their accommodations. Live and recorded video of bands or entertainers performing at a hotel can help sell more tickets to an event. It can also provide the resident chef a virtual stage to demonstrate preparation of the evening’s dishes. Video can also enhance digital signage’s potential as a source of revenue by displaying high-value advertising about local restaurants and attractions off-site. These benefits extend to convention centers, which often simultaneously host several large events within their massive spaces. Video-enhanced signage can provide arriving exhibitors a virtual tour of the space, or guidance on where to unload and set up their booths and get their staff registered. Once the show is underway, live video of a keynote speaker or a product demonstration on the show floor can reach distant locations where people congregate, such as the dining area or the lobby. As exhibitors grow more sophisticated in how they compete for attention, they’ve increasingly come to rely on video and digital signage, and they are often willing to rent it for big shows. Savvy convention centers are discovering that the cost to buy and install a dedicated videoenhanced digital signage infrastructure often costs less than what exhibitors pay to rent the equipment. So providing video-enabled digital signage, a supporting network infrastructure, content development, and webcasting capabilities not only makes exhibition facilities more competitive when attracting shows, it also opens the door to new revenue streams. So the question isn’t whether or not video-enabled digital signage offers significant value to the hospitality industry. It’s whether that value comes at a prohibitive cost to a digital signage system’s bottom line, operational complexity, or network footprint. It wasn’t long ago that distributing video required laying of coaxial cable to television endpoints for display. Not only did this limit distribution to the physical location of the cabling, it was expensive to wire buildings twice — once for the IP network and again for video. These problems largely disappeared with the arrival of video over IP technology, which circumvented the need (and cost) for additional wiring, and eliminated the distance limitations of coaxial systems. Plus, IP video loses none of its image or sound quality whether you send it across the room or across the world. Additionally, like digital signage, IP video continues to grow more sophisticated. Today’s encoding appliances have grown sophisticated enough that all they require to broadcast high definition live or on-demand IP video to an unlimited online audience on any playback device — including mobile devices — is a video source and a network connection. And they stream reliably for years without any management intervention. With today’s high-speed networks and technologies such as IP multicast, the impact on the IP network is negligible. distribution of signage was limited to those endpoints only. It could not be sent to other devices such as PCs/Macs or mobile devices. The first limitation, which speaks to cost and complexity concerns, has been surmounted by new platforms that stream the entire signage visual as a video stream. In other words, rather than embed video streams into signage, signage is bundled into a high definition video stream for IP distribution. This reduces system costs by replacing the expensive computers at each signage endpoint with an IP-compatible settop box that costs a fraction of the price and operates reliably around the clock. Bundling signage into an IP video stream also overcomes the second limitation, but, more significantly, it may introduce a new era wherein all the capabilities afforded to IP video now apply to digital signage. For example, signage can now be delivered over Wide Area Networks (WANs), enabling a hotel chain to send content from its corporate office to locations worldwide. Or hotels and convention centers can post signage on their websites to allow guests — and anyone else — to view it on online, or even on their mobile devices. That last benefit is particularly attractive to event spaces, since it allows individuals unable to attend in person to view live signage and video streams remotely. Offering streaming content by subscription or pay-per-view also offers host venues with additional revenue streams. Offering this content as video-ondemand further allows exhibitors to leverage their investment in the event — long after the event is over. Clearly, the less engineering a system requires on the part of the hotel or convention center, the lower its overall cost and complexity will be. So turnkey solutions that couple signage, video encoding appliance, and content management software deliver better value while minimizing installation and operation costs. Also, as we mentioned earlier, incorporating IP video cannot compromise digital signage’s central value of enabling quick and simple updates and customization to content. Viable solutions will allow hospitality staff to update the text, graphics, and video elements of their digital signs independently of one another. Andy Howard (andyh@vbrick.com) is senior director of marketing at VBrick Systems. Howard has over 15 years of experience in networking, software, internet security, and IP Video. 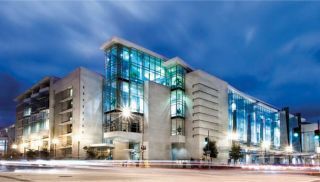 With nearly one million people attending annual events, conferences, and exhibits at the expansive Walter E. Washington Convention Center in downtown Washington D.C., management decided that a dedicated digital signage system was a necessity. Not only would digital signs help keep visitors up-to-date and oriented about events, it would enable clients leasing the facilities to run their own content. The key driver was flexibility. Every week the Center hosts events targeting different industries and associations, different sponsors, and different audiences. Increasingly, it found clients requesting digital signage to display content that they could easily customize and update. Many of those clients were renting systems at great expense — paying not only for the displays, but also for cabling and content distribution. Yet, undeterred by the cost, their demand for evermore sophisticated signage was growing. Soon, clients expected signage that incorporated video to better attract visitors to key events, or to broadcast those events where visitors congregated. It didn’t take long to conclude that video-enabled digital signage was the future of exhibiting, and the Center decided to future-proof its facility. This challenge, however, was literally gigantic. The second largest building in Washington D.C., the Center’s three massive levels fill six city blocks — the length of two Washington Monuments laid end to end. The digital signage outlay it envisioned wasn’t small either. It encompassed 140 displays, including 60 high-definition flat panel displays distributed around the facility, as well as 90 more (on a separate system) located at the meeting room entrances. In addition, the Center planned to install a series of video wall panels. One was a 20- x 6-foot video wall comprised of 18 displays mounted on the Center’s second- level skywalk. Another in the lower-level concourse measured 2 x 16 feet. And three additional video walls in each of the main lobby areas measured 8 x 6 feet. All of this required wiring the facility to stream digital content to signs located at the Center’s most distant corners. Fortunately, the Center had been designed with a fiber network that allowed it to distribute individualized content on four separate multicast channels. Considering client demands for video-enabled digital signage, the Center opted to power each channel using a high-definition H.264 encoding appliance from VBrick. Designed to stream live or on-demand video via internet protocol, the encoders enabled the Center to stream content to either end of the facility while compromising neither image quality nor network bandwidth. By having a dedicated digital signage infrastructure, it costs clients less to utilize this technology than the combined rental fees they had previously incurred. In addition to making the Center more competitive, this also made it simpler for clients to upload and manage their own content on a ready-made system.